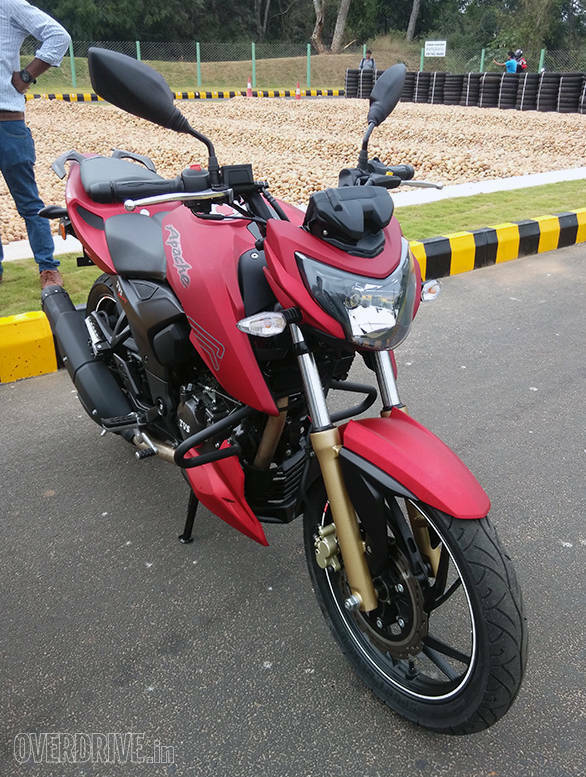 We have just returned from the TVS plant at Hosur outside Bengaluru where we were offered the opportunity to ride the new TVS Victor and this, the new TVS Apache RTR 200 4V. 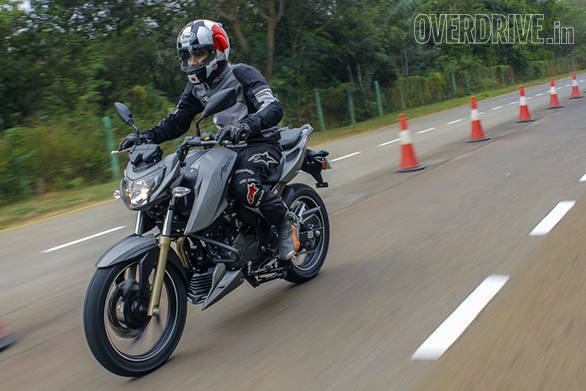 Here's everything you need to know about the new TVS Apache RTR 200 4v. 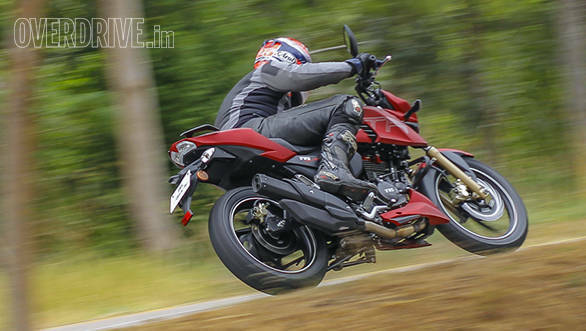 TVS have been sitting back, allowing the Apache to do its thing in the market for ages now. The rumours of a larger RTR have been around for years too. 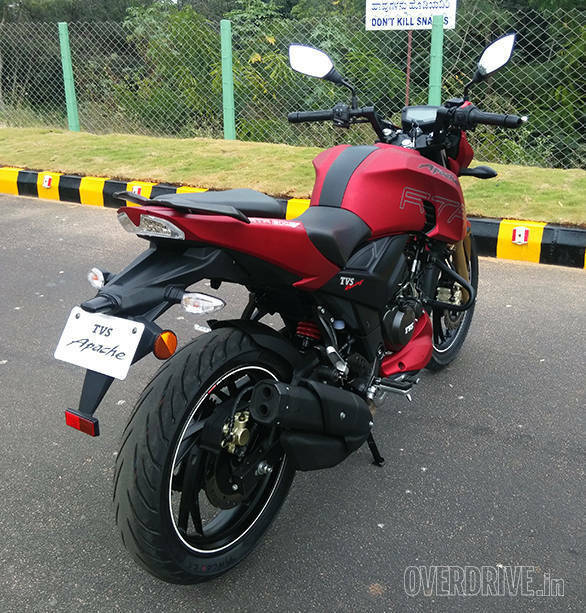 But finally the RTR 200 is out. It would ordinarily have gone head to head with the Bajaj Pulsar 200NS but as you know that bike isn't currently available. 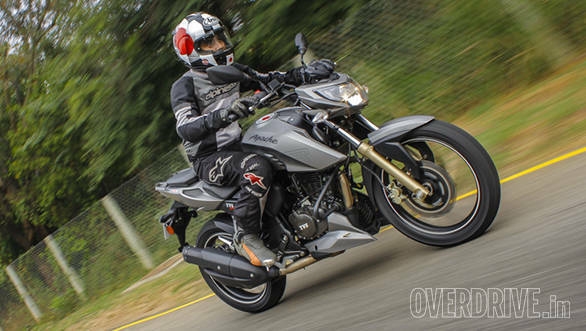 In essence, outside of the KTM 200 Duke  which is substantially more expensive  the RTR has no direct competition. It's an interesting lull in the bottom of the premium-sporty space that the RTR enters. TVS, of course, will expand further into the premium space when their version of the BMW G 310 R debuts, most likely later this year. The new 200cc engine is effectively all-new, and makes 21PS at 9,000rpm, and 17.5Nm of torque at 7,000rpm. It uses a Nanofriks coated piston (a nano particle blend that acts as a lubricant during the initial running of the engine). Up top is an all-new four-valve head operated by a single overhead camshaft. Finally, you have petal discs at each end and TVS say the ABS versions  still more variants  should show up in two months' time. Does the RTR look familiar? TVS are very thrilled that as much as 60 per cent of the 2014 Auto Expo's Draken Concept has made it to the RTR as is. 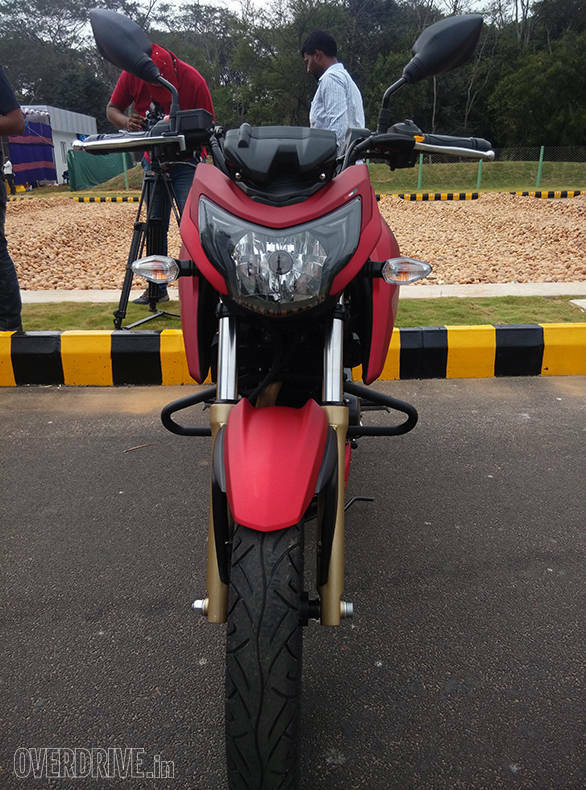 This allows the RTR 200 to cut a fairly dashing figure, especially given TVS' choice of bold, matte colours. The tank extensions look good and serve to ram air into the oil cooler as well as on the engine head. The tank itself is slimmer that the Draken but the flat planes and sharp edges look neat. TVS did move the fuel filler cap  which inexplicably has an orange key hole cover  to the right of the middle. This leaves a crease that used to be symmetric but now looks like someone damaged your tank. On the flip side, the tank is actually a cover made in three pieces of plastic. TVS intend to offer customers different colours for customisation. The tank is matched to the tail piece which also looks smart and hosts the second half of the split seat and a sharp looking grabrail. The side panels are dark plastic and we were told that the final production motorcycles would vary slightly from the bikes we rode in certain areas  finish levels and textures. Overall, the RTR looks sharp and fresh with its dinky headlight, cool DRLs and that small pod with the all-digital instruments on top. Yes, this is the same way the BMW G 310 R also configures its headlight-instruments form. 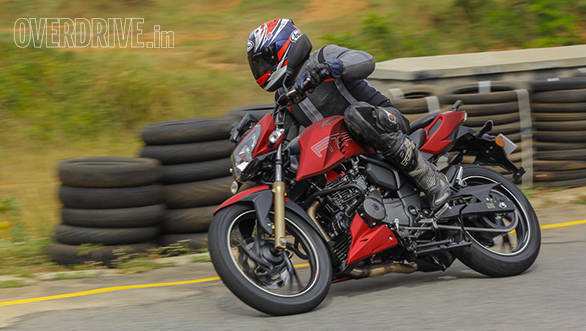 The TVS Apache RTR 200 4v is quick. The engine is refined and only near the top does it betray any signs of hard work. Progress is efficient and I saw as much as 127-130kmph regularly at TVS' small but fun test track at Hosur. Flat out performance may not match the Bajaj Pulsar 200NS, but I'd be very surprised if the TVS wasn't quicker and easier to ride in traffic. I did miss a sixth gear though. If TVS had added it, that would have completed the list of cool things to have as well as allowed a taller top ratio that would have done wonders for the bike's highway ability. The handling felt good too. The Pirellis are no surprise but the TVS' performance is very good as well. Pushing as hard as I could, I did conclude that the front tyre had less outright grip than the rear by some margin and that causes trust issues near the limit. It isn't a dealbreaker but I'd go to the Angel GT at both ends when I replace tyres. The RTR is effortless to change direction, both in corners and side-to-side. But the stability to match makes it trustworthy. The TVS track's sweeping, bumpy right turn had the bike bottoming under hard cornering as I laid on the stress but it never changed its line. Very nice indeed. The brakes are very good too, offering a natural-feeling combination of bite and progression. What surprised me is how much more crisp and responsive the fuel-injected version of the engine proved to be. I didn't get to ride that version till the very end but the crisp responses were worth as much as 7-8kmph in corner exits, which is a massive margin. All told, TVS have produced an excellent 200 that I believe will prove to be a persuasive upgrade to the current crop of 150s and 180s. This bike is destined to have loads of variants. Between TVS and Pirelli tyres, fuel injection and carburettors and the impending introduction of ABS, there are at least eight variants possible, in four colours each. Wow. Given how much better the fuel-injected version felt, I would be inclined to suggest that TVS should be offering just that engine, with the choice of TVS or Pirelli tyres. ABS should just be standard. 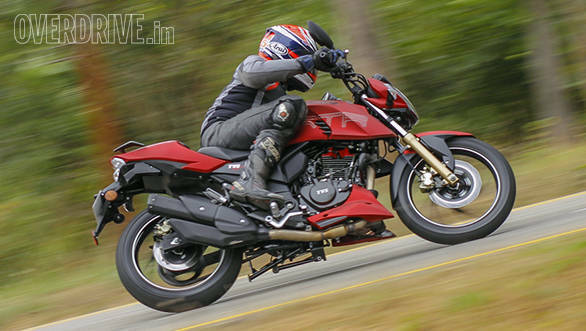 The TVS Apache RTR 200 4v should have been here a year ago. But TVS' product roll outs are famous for taking their own sweet time, so no surprises there. But the spec and the performance are of a high order and TVS are fortunate to have a hole in the market in the shape of this very motorcycle right now. So while we wait for the test bikes so we can do the full road test, the question is this  TVS' engineering has delivered. Can their sales and marketing teams capitalise on that?